1) Ca’ del Bosco Franciacorta Cuvee Prestige Brut: Robert Parker’s Wine Advocate 92 pts. This beautiful sparkling wine shows a unique aromatic profile with spicy notes of spearmint and fresh oregano leaf that pop to the top. Beyond those vertical aromas are heavier tones of stone fruit, honeydew melon and blanched almond. 75% Chardonnay, 10% Pinot Bianco and 15% Pinot Nero. Offers spicy and vibrant aromatic tones that you don’t find in its peers. 2) Trimbach Clos Ste. Hune Riesling 2011: Robert Parker’s Wine Advocate 93 pts. 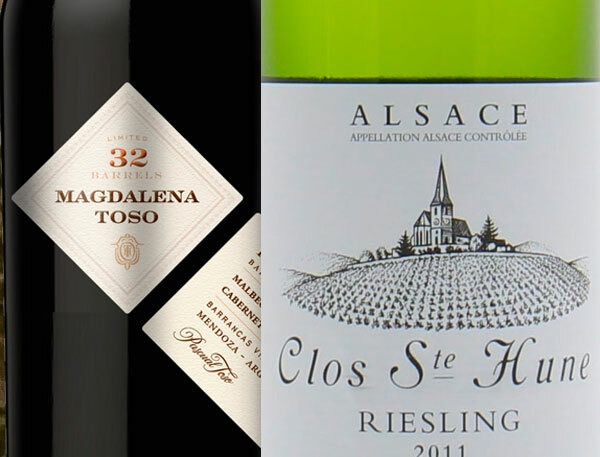 The chalky, pithy expression of extract richness in Trimbach’s 2011 Riesling Clos Ste-Hune is much more typical of its type not to mention more backward than the impression conveyed by this vintage’s Frederic Emile. But I wouldn’t have expected quite such a carved-in-stone character from this vintage, one in which Frederic Emile too, in its distinctive way – not to mention the majority of Trimbach wines – excels. Piquancy of legume sprouts and fruit pits mingles with smoky, chalky and alkaline notes on a firm, polished palate, leading to an impressively sustained though slightly severe finish. It will suffice, I suspect, to taste this the next time after it is released in several years, and I would expect it to impress through at least 2028. 3) Robert Mondavi Cabernet Sauvignon 2014, Oakville: This wine is quintessential Oakville Cabernet Sauvignon: presenting both power and finesse, with deep, dark cassis and black cherry fruit; sage, nutmeg and vanilla spice; a velvety texture with a plush, juicy finish that lingers luxuriously on the palate. Blend: 88% Cabernet Sauvignon 5% Cabernet Franc 3% Malbec 3% Petit Verdot 1% Merlot. 4) 2015 Altvs Cabernet Sauvignon, Coombsville: WE 90 pts. This is a grippy, dense and powerful red, blended with 5% Petit Verdot. Approachable in its youth, it shows strong flavors of red currant, cherry and coconut, with a lushness that lingers on the finish. 5) Don Melchor 2011, Maipo Valley: James Suckling 95 pts. Gorgeous aromas of eucalyptus, black currants, berries and stones. Medium to full body, fine tannins and tension. Firm, caressing texture. This remains one of the top cabs of Chile as always. Better in 2017. 6) Pascual Toso Magdalena Malbec 2014, Argentina: This wine shows complete harmony between color, aroma, flavor and finish. Utilizing Paul Hobb’s best 23 Oak Barrels selection of Malbec; which is characterized by an intense red with notes of violets and sweet tannins. The Malbec is combined with a touch of the winery’s best Cabernet Sauvignon in order to ensure consistency. Ripe, juicy raspberry fruit, with lovely boysenberry and plenty of vanilla, spice and chocolate, come through on both the nose and palate. Fairly round and inviting. Magdalena is an elegant Argentine red blend. Excellent to pair with pasta, red and white meats and dishes with any creamy sauces. 64% Malbec, 36% Cabernet Sauvignon. James Suckling 96 pts. Fantastic aromas of blackberries, blueberries, flowers and stones. Hints of dried fruit. Full-bodied, very tight and precise. Wonderfully silky and powerful. Such structure and length. A blend of 80% malbec and 20% cabernet sauvignon. Needs two or three years to come together. Due to the expense of these wines, I need reservations! Please let me know if you can come!